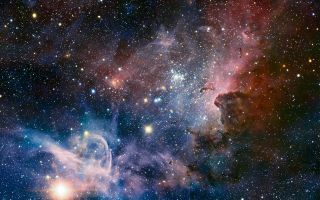 ESO’s Very Large Telescope has delivered the most detailed infrared image of the Carina Nebula stellar nursery taken so far. In this space wallpaper, ESO’s Very Large Telescope has delivered the most detailed infrared image of the Carina Nebula stellar nursery taken so far. Many previously hidden features, scattered across a spectacular celestial landscape of gas, dust and young stars, have emerged. Hundreds of individual images have been combined to create this picture, which is the most detailed infrared mosaic of the nebula ever taken and one of the most dramatic images ever created by the VLT. It shows not just the brilliant massive stars, but hundreds of thousands of much fainter stars  that were previously invisible.